I often hear people tell me they don’t want to cruise because it’s so expensive. However when you break down the actual cost for a cruise and start adding in everything you get for that money, Cruising can be one of the most economical methods of taking vacation! Let break it down, What do you get for the money you spend on a typical ‘ocean cruise’? I am going to use my last cruise as an example: A 7-Day Canada & New England cruise from New York that cost me $3038.00 (all in) for my wife and I for our balcony stateroom. That breaks down to $434.00 per day for our cruise. That is the same price, you would have gotten had you travel with our little group , so I was not getting a deal or special pricing on this cruise. Rooms: While even the largest suits don’t stack vs a comparable hotel in terms of size, from a comfort level, (beds, room service, ect) standpoint, I have been much happier with cruise stateroom than hotels. Food: The cruise line offers a pretty wide variety of meal options in the included venues. Everything from a buffet to sit down restaurant style dining rooms. The food is above average, and sometime quite special. Dietary restriction can be accommodated with proper advance notice. Onboard Entertainment: Broadway style show, comedians, live music, bars, disco club, piano bar, and much much more. Our ship had a ropes course, swimming pools, hot tubs, waterslide, miniature golf, basketball hoops and a small bowling alley. if you get board on a cruise ship, your want to be board. Gratuities and Drink package: By creative booking I was able to include all of these in the base package price. Entertainment – $150 night – While just going to a bar might be cheaper, getting tickets to a show will be much more. So we will average it out. So at a fairly even matchup between the two, the Cruise works out to be $434/day and traditional hotel is $475. While I know some folks out there will argue that the can eat or drink or be entertained for a lot less than $475, My counter argument is that inside staterooms are a lot less than balconies as well and it’s not uncommon to find cruises at or under $100/day. 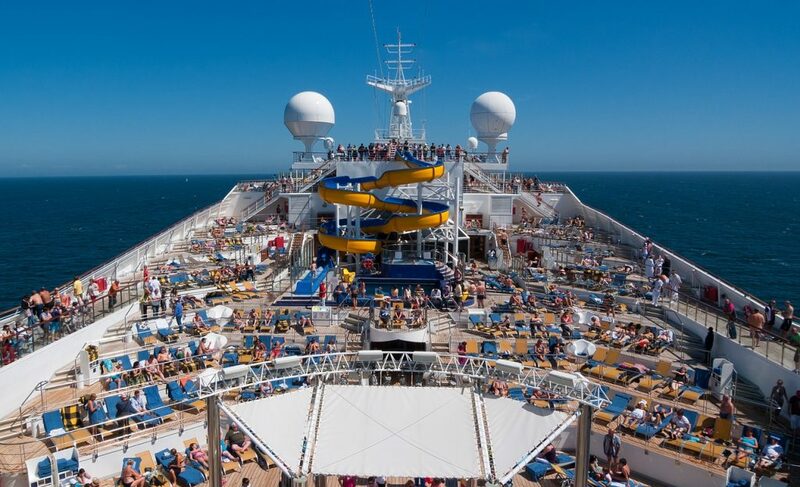 Wide variety of activities aboard cruise ships.